Last week JD and I sat down with a bottle of prosecco to finally watch the new Great Gastby film. I had heard mixed reviews, but good things overall. I'm not sure what I was expecting, I've read the book several times and have seen the old version of the film. Clearly the story would not change much. I was most excited to see the costumes and set design and was not disappointed by it. The gorgeous mansions, the city apartment, the ash heaps, it was all near perfect. I noticed and appreciated that the script stayed close to the text. Maintaining a good amount of the original dialogue was a nice touch, though I always feel uncomfortable when Daisy makes her speech about Nick being "an absolute rose" at their first dinner together. Come to think of it, very little of that first meeting is pleasant. Daisy is extremely obnoxious the entire time, but I suppose her behavior serves as a good introduction to her character, and the depth of it. There were a couple of things though that I did not like about the film. I wasn't especially fond of Nick Carraway telling the story from a sanitarium, in for being a morbid alcoholic. I didn't see the need for it and thought it gave the story a much darker air, when it's already such a dark tale. It's true that the events that unfold could have driven his character to seek out the help of a sanitarium, but come on, he specifically says that he has only been drunk twice in his life, a little bit that was included in the film, and the story is told in past tense. From that point on, the opening scene, the story could only progress in a different way than it had originally been intended and in my opinion, brought the focus away from Gatsby and sickened Nick's obsession with him. A second thing that I did not appreciate in the telling of the story was Gatsby and Daisy's relationship. Daisy is portrayed in a much more pleasant light, as if she is completely innocent, just following her heart, or the breeze. She and Gatsby meet again and are in love and she will leave her husband for him, everything will be find. Then there is that fateful afternoon where they all go into town and get into that massive fight. When it's all over, when they are leaving for Europe, Daisy is silent. The phone rings and they pretend that she was powerless, back to being a pawn on her husband's chessboard. He made the decision to leave and so they did. You're supposed to feel disgusted by the Buchanans for blaming Gatsby, setting him up, and skipping town, retreating back into their money as Fitzgerald put it. Absolutely no sympathy should be felt for them, yet this film allows it. And one tiny little thing regarding the music... 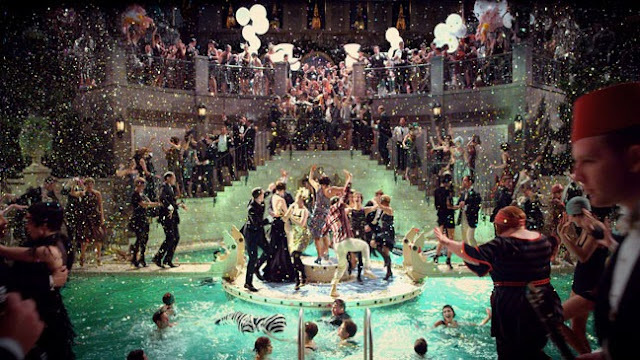 While it was cool to see jazz age parties set to modern music, it would have been nicer, in my opinion, to throw a little 1920s in there too. Adaptions can be tricky, especially with classics. Not everyone is going to be pleased with the outcome, but overall I did enjoy it.